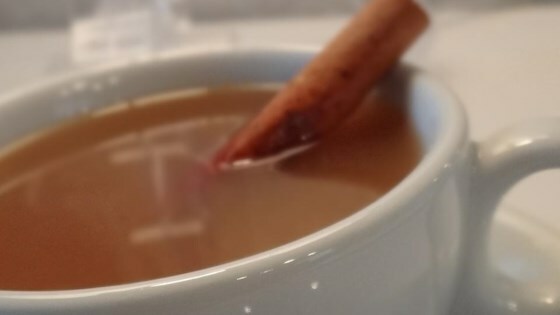 "This Texas hot apple cider will warm your boots on a cold night! There is enough for the state of Texas in this recipe. It's big! Perfect for parties! Plus it will make your house smell so good!" Mix apple cider, pineapple juice, and nutmeg in a large pot. Press cloves into orange in the shape of Texas. Float orange and cinnamon sticks in the cider mixture. Heat cider mixture over medium heat until warmed and flavors have combined, 15 to 20 minutes. This can also be made in a slow cooker on Low setting until warmed. I used the bottle sparkling apple Cider, Excellent...the best for a cold day like today! It was pretty good, but too sweet for my taste. All that pineapple juice just made the sweetness a little overwhelming. This is a perfect drink to share with friends on a cold Winter’s day. I offered guests the opportunity to “spike” their drink with either Peach Schnapps or Fireball! So easy! Threw everything in a crockpot, let it go for about 4 hours, yum!